"My memories become intertwined with hers as I rediscover my past through her stories. Together, we've created a family album of what was once the intangible landscape of my childhood. The work encircles itself as our conversations about native flowers, life and death become the seeds of my photographs. Each time I visit Margaret I enter through the kitchen door, and each time she has a new story to tell which enriches my work like a complex broth. The kitchen and the yard are where we do our fieldwork, as we pick fruit and remove the rotten parts to make a more palatable jelly. 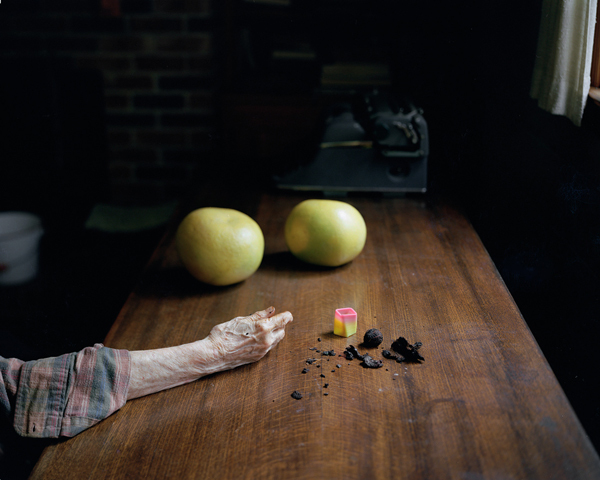 This process has become a sort of poetry for me, as I document her showing me how to strain the last remnants of sweetness and color from crabapples, using bandages to catch the pink-stained juice."